Admittedly, apart from a getting some guidance on one or two essentials, this was more or less made up as I went along. Melted everything in a double boiler except the essential oils. When completely melted, removed from the heat and stirred and stirred until it went puddingy and had cooled a little. Added the essential oils and poured into a mould. Presto!! I made soap!! I have to be honest though, I didn't use the quantity of essential oils in my original recipe because they are too expensive to waste if it all went bit wrong. Therefore, not much aroma happening except for coffee and the cocoa comes through a little too. However, it does foam up lovely and the grounds are exfoliating. 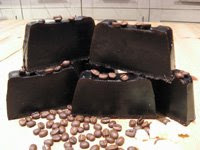 It's a great body bar and coffee is used for its many beneficial properties in quite a few high end salon beauty treatments. Some other points were made by more experienced soap makers such as suggestions on layering; to pour first portion of soap and allow it to develop a skin then spritz the surface and pour on the next layer. This would give a fairly defined layer. To get a more blended effect where the line was less defined could be to pierce the skin of the first layer at various points to allow some liquid to escape before adding another layer or to scatter coffee grounds after spritzing which may colour the lighter layer slightly. Regarding the recipe, it was suggested that I was probably at the limits for the butter (too much butter may affect lather quality). It was thought that I had maybe used too much coffee grounds and that 15g rather than the 25g I used may have been more appropriate. I have to agree, it was very dark and I noticed today that the soap dish has developed a brown soapy puddle from the drips. All in all, this first time experience was a fantastic one. Another thing this experience has done for me is to really look around at all the possibilities for this method of soap making. I was genuinely amazed at the number of wonderful effects that can be created with this clean and safe method. The possibilities are endless, however, somehow I think I should learn some of the basics first before even entertaining some of the extravagant methods that many of the members have used, just look in their galleries. These are a real source of inspiration!